New York/London |When Federal Reserve chair Jay Powell last week lauded the US economy’s performance as “extraordinary” and delivered a sunny forecast, it was the bond market that reacted first as yields on 10-year Treasuries raced to the highest level since 2011. Until Wall Street’s overnight sell-off at least, the giddy rise in yields had done no more than erase the sheen from a US stock market that set a fresh record high less than a month ago. Indeed, a ratcheting higher in expectations for the US economy should be good news for American businesses. However, the bond sell-off raises the stakes for third-quarter earnings season given higher yields require profit growth to justify current equity valuations. 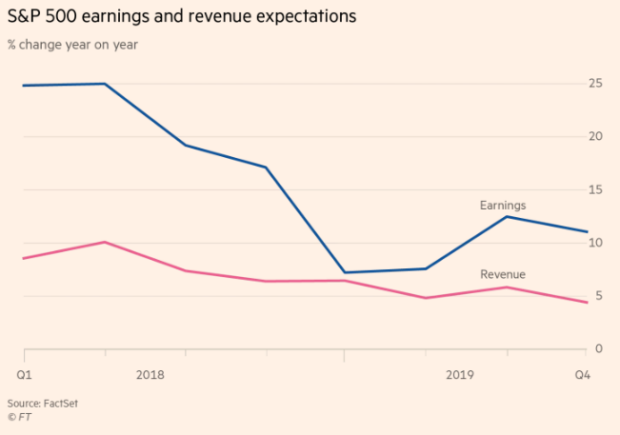 And while optimism about the US economy is a boon, if it ultimately brings much faster wage growth, that risks eroding the profit margins that have helped power earnings. It could also prompt the Federal Reserve to raise interest rates more quickly. 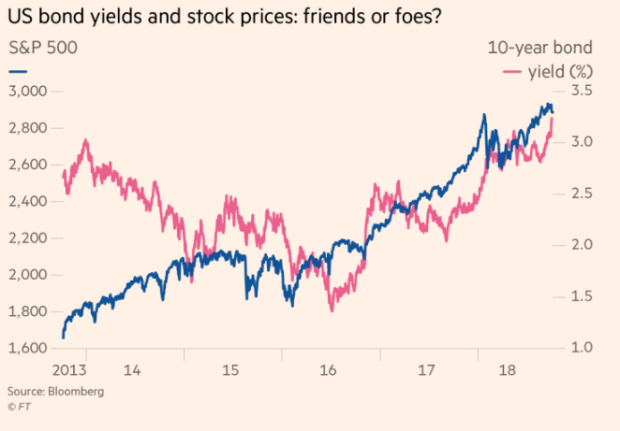 Until Wall Street’s overnight sell-off at least, the giddy rise in yields had done no more than erase the sheen from a US stock market that set a fresh record high less than a month ago. The delicate interplay of third-quarter earnings, which kick into full gear when US lender JPMorgan Chase reports results on Friday, and the level of yields will help shape the outlook for equities in coming weeks, analysts and investors say. Rates are a key component of a widely-used valuation methodology that calculates the present value of an asset by discounting its expected cash flows using a risk-adjusted interest rate. That is a combination of the risk-free rate — typically long-dated US Treasuries — plus an extra premium for buying something other than sovereign debt. And as yields climb, investors require better earnings growth to justify valuations. The S&P 500 was trading at 16.7 times forward earnings for the next 12 months, above the five and 10-year averages. Wednesday aside, while the reaction of the broad S&P 500 index has been relatively muted so far, there has been plenty of rotation beneath the surface of the world’s largest stock market. As expectations for the strength and duration of the US expansion have increased, investors willingness to pay a premium for growth stocks such as tech has diminished. Even before the overnight sell-off, the S&P 500 info tech sector had dropped almost 3 per cent this month, while the consumer discretionary sector, which is home to Amazon, had fallen by a similar amount. The Nasdaq had weakened more than 3 per cent before sliding further on Wednesday. Rising yields have also sharpened scrutiny of companies carrying more debt. Strategists at Goldman Sachs recommend investors currently favour companies with stronger balance sheets. As yields climb, investors require better earnings growth to justify valuations. Those that remain confident about the outlook for stocks can take some comfort in the health of corporate profits. Underpinned by a combination of economic growth, the corporate tax cut agreed late last year and share buybacks, companies in the S&P 500 are eyeing the best three-quarter stretch for profits since 2010. Wall Street analysts are predicting earnings rose 19 per cent per share in the third quarter over the previous year, according to FactSet. That would be a strong showing, but still represent a decline from about 25 per cent growth in each of the first two quarters of 2018. The sheer speed of the rise in yields has taken some by surprise and, if it were sustained, would be problematic. Yet a more orderly advance would be more likely to slow the US bull run rather than kill it off. Jurrien Timmer, director of global macro at Fidelity Investments, said the yield on the 10-year, which was at 3.22 per cent on Tuesday, has upside to 3.5 per cent over the next six to 12 months as the bond market reprices to align with expectations for the path of interest rate increases from the Fed. That scenario would be imperilled should the economy that Mr Powell hailed last week begin to generate stronger inflationary pressures. Economists expect a report on Friday (AEDT) to show that the annual rate of core US inflation, excluding food and energy, rose to 2.3 per cent last month. Although stocks have felt the fallout from the bond ructions this month, others believe the bigger risk could be brewing next year when the effects of fiscal stimulus begin wearing off, earnings comparisons are less flattering and the Fed is still tightening.